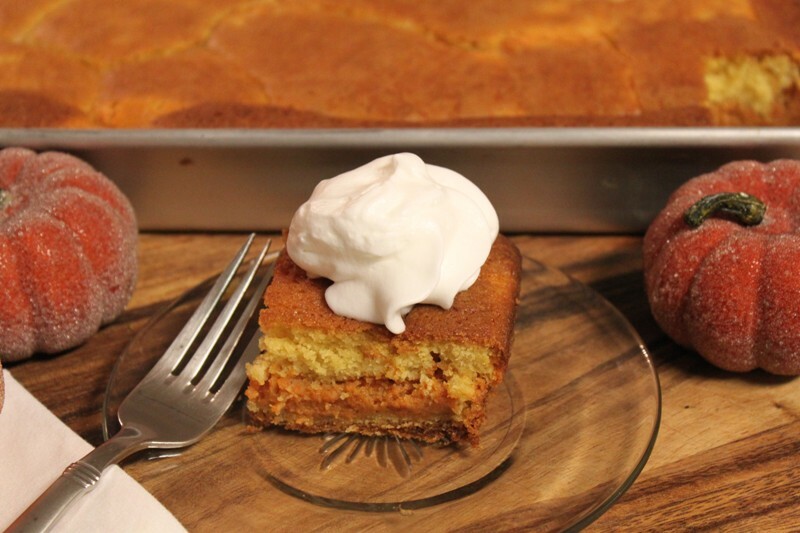 Pumpkin Gooey Butter Cake | Rosetta Bakes! It’s that time of year when pumpkins are plentiful and fall is in the air! This is also the time of year when we think of all our favorite fall and winter comfort favorites. I’m a big fan of pumpkins, and enjoy the assorted baked goodies that have pumpkin in them. Here is a really moist and yummy recipe that calls for pumpkin. You can use fresh, or canned, but the recipe will call for canned pumpkin. When this cake is baking you’ll smell its great aroma though out your home…no pumpkin candles needed in the home while this cake is in the oven! Preheat oven to 350 F. Lightly grease a 9 x 13-inch baking pan. Cake: Combine cake mix, egg and butter and beat until smooth. Pour into baking pan. Filling: In another bowl, beat cream cheese and pumpkin until smooth. Add the eggs, one at a time, mixing well after each addition. Add vanilla and melted butter and mix well. Add the confectioner sugar, cinnamon and nutmeg and mix well. Spread over the cake batter and smooth out evenly. Bake 40 to 50 minutes until the top of cake feels firm. Be careful to not over-bake because the center should be a little gooey.